The BFG is no ordinary bone-crunching giant. He is far too nice and jumbly. It's lucky for Sophie that he is. 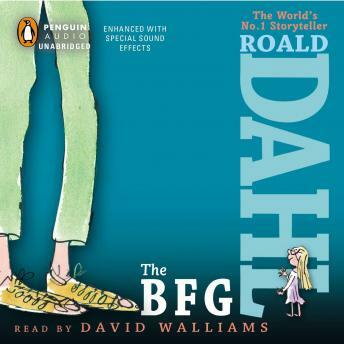 Had she been carried off in the middle of the night by the Bloodbottler, or any of the other giants—rather than the BFG—she would have soon become breakfast. When Sophie hears that the giants are flush-bunking off to England to swollomp a few nice little chiddlers, she decides she must stop them once and for all. And the BFG is going to help her!Soon to be a Steven Spielberg film! One of my all-time favorite books! I love the language that the BFG speaks. I laughed throughout the entire book. Great narration as well. One of Roald Dahl's best books! This audio was perfect for my 6 year old it helped him finish the book in no time! Great book my 8 year old loved it!!!! After she had to check out the movie she said the book was way better. Narrator is great! Loved to listen with my boys. Listened to this with my six year old on a road trip. It was great fun and the narrator did a great job! This book was amazing and so well read! I had such a great time listening to it in the car on a long car trip. I will continue to replay this great book many many times again. Great book! My children from 8 years old to 16 years old loved it. We listened to it on a family road trip. Great whimsical story! Hopefully the movie lives up to the book as I throughly enjoyed this story. Outstanding. Audio books are my visually impaired child's TV. This book had her attention from the beginning. This is one of my favorite books by my favorite author. The only thing that would make this audiobook even more amazing would be if the narrator talked a little bit faster.